Recyclemania. One of the 2011 Eco Rep Projects. An article written by Ore VanGruber, a 2011 Yeshiva Eco Rep. 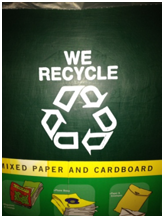 Learn more about Einstein's Newest Environmental Club!